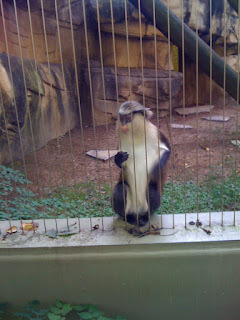 As you may have read before, Jake and I are members of the Memphis Zoo and we love going there after work. Last Saturday the new exhibit, Teton Trek, opened for member preview week. We were out of town (on the church retreat) but wanted to get in before the "regular people" got their turn. We went today and it was the perfect day for it. We prefer week days to weekends because of the crowds (we've got a very popular zoo, not that I'm complaining!). In addition, the weather was beautiful today. We started by trekking (pun intended) to the Teton Trek. 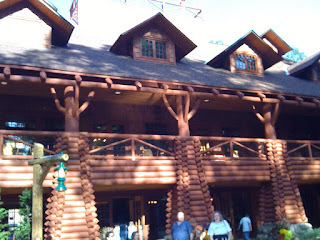 It is modeled after Yellowstone and the Grand Teton Park - the first picture is the Great Lodge, the entrance to the exhibit. Once you go in the Great Lodge (which is beautiful), you can go up to a viewing area or through to the rest of the exhibit. The grizzlies are ahead. 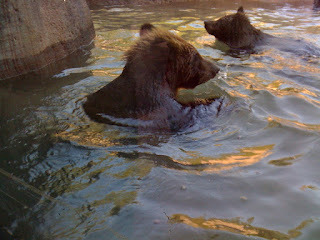 Today, the grizzly cubs were out and playing (second picture) in the water. They are little cubs that were rescued after their mom died in Wyoming. There are two other bears from Alaksa - they alternate these three cubs and those two grizzlies. There are live fish in the water that they can eat! You can see the grizzlies from many different views so it didn't seem crowded at all. In addition, there are swans, cranes and grey wolves. There will soon be elk. Some of the exhibit isn't actually finished. The wolves were playing with the freshly laid sod! On the way out we stopped at the Old Faithful Entry Plaza, the first thing you see on the way in (which we avoided coming in due to the overflow of children). It replicates Old Faithful and provides a nice fountain area. I'm sure there will be plenty of kids continuing to play in it - today even there were and it was a bit chilly. Great write up. I can't wait to go see it myself. Can't go this weekend, though. My son has a band contest.